You've watched the movie Mission Impossible 2? There is a piece of the background scene of a tiny island called Bare Island. Unlike the island in general, Bare Island seemed like a military site and look alienated. Although the island seems different, wonderful natural scenery surrounding it, not even a little Hollywood director who made ​​the island as a setting for taking pictures. Bare Island is located in the southeast of Sydney, New South Wales, Australia, adjacent to Botany Bay. This island was once used as a dwelling Aboriginal and Gweagal. Then in 1770, James Cook discovered the existence of the island and since then the name of Bare Island was used to refer to the mainland. But in 1877, the colonial government to do that fortification was completed eight years later. Finally, in 1967 entered as Bare Island New South Wales Parks and Wildlife Service for the category of museums and family entertainment park. 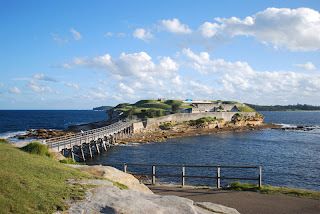 Bare Island is connected by a bridge of La Perouse. Areas that can be visited while on the island is a military fort and several buildings of the tunnel. You can visit using a tour guide or traveling alone. Interestingly, this area now known as the most beautiful scuba diving locations in New South Wales and in the summer the region is filled professional divers. Marine life that could be found, among others, big belly, sea dragons, pygmy pipehorses, red Indian fish, and Port Jackson sharks.